I wish I could show you what the luncheon table looked like the other day when the Alameda High School friends met for lunch. Going to the same restaurant in Alameda almost ensures us of the same table for eight we have become accustomed to. It is on the water overlooking the whole of the San Francisco skyline which is a treat in itself if the sky is clear and blue. On some days another group may have confiscated it and we just give them our disgruntled old lady stares until they look sufficiently guilty. This is the seventy second anniversary of the Nutcracker Ballet in San Francisco, and what makes it special to us is that our friend danced in it for the very first performance and for the next eleven years. She was Clara in the first performance, and said they all played every part. She was glad not to have ever played the Mouse! I asked her when they started rehearsing for it each year and she remembered it as being in October and fitting it in between school. She danced with the San Francisco company as well as the New York Ballet before retiring and teaching other fortunate young dancers. The mother of one of the other members of our little group was her first teacher, and was herself a ballet mistress in both New York and Montreal, Canada. Coincidentally, a 92 year old neighbor took her dancing lessons from this lady as well. 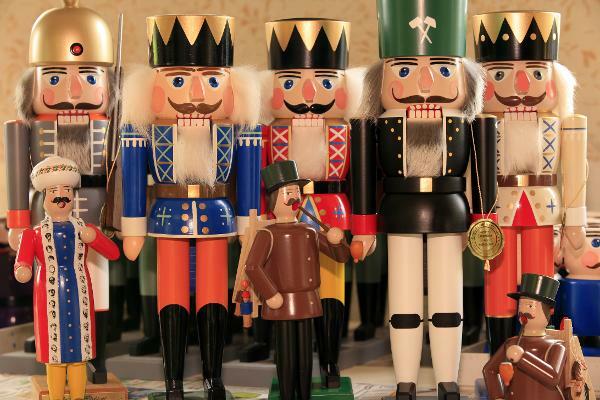 Tchaikovsky composed The Nutcracker Ballet in 1892 and it was an immediate success, and of course, has spread all over the world with Christmas performances thrilling both children and parents ever since. When it appeared in San Francisco in 1962, my children and I were in attendance as well as in succeeding years until they married and moved away. It was a very special before-Christmas treat with all of us dressed in our holiday finery. Their own children were introduced to that wonderful music and colorful costumes in their own time in both Seattle and Santa Barbara. T.S. 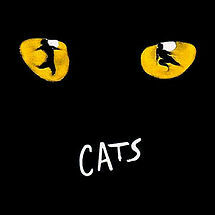 Eliot was the inspiration and wrote the lyrics for the Andrew Lloyd Webber musical CATS. 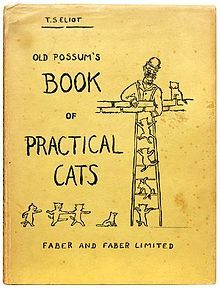 It was based upon “OLD POSSUM’S BOOK OF PRACTICAL CATS”. Old Possum was the name Eliot used for himself in playing with his godchildren. Raima was an Army nurse in the second World War, and as such, she was my idol, and I joined the R.O.T.C. thinking I was following in her footsteps, but as it turned out, her footsteps were far too big. Raima did not have an easy childhood, her mother died when she was only six, leaving her and two brothers. Her father took her oldest brother, leaving Raima and one brother to stay with various families until he got things figured out. After several years of moving from one family to another, our Aunt Helen, a kind, comfortable and pragmatic woman, collected both children and took them home to raise with her own two children, in Alameda, CA, in the big old house our great-grandfather had built. After graduating from, Alameda High School, where I would also graduate in another decade, Raima became a nurse, and when the War began for us in December, 1941, she joined the Army as a nurse. 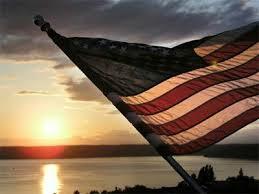 She was my father’s favorite cousin, and he, being a Navy man, was initially disappointed that she did not choose the Navy, but years later, the two old warriors met many times over a fishing stream, along with her husband Charlie, whom she had met while stationed in France during the War. In 1942 she was sent to Casablanca, North Africa where she stayed until the fighting broke out in Italy, and we prepared to invade Italy via Anzio. Raima was part of a portable hospital unit, following General George Patton’s 3rd Army, and was at Anzio during the tough fighting. Thanks to the movie M.A.S.H., we are all familiar with the Mobile Army Surgical Hospital which actually came about in 1945, but were deployed as such in the Korean war. They were preceded by the portable surgical hospitals in the first and second Wars. In 1944 the 3rd Army moved into France where it remained until D-Day. From France they went to Germany, where Raima remained to nurse the survivors of the Holocaust as they were released from the Death and Concentration camps. Raima died at the age of 98, and yesterday she was memorialized with an honor guard and the mournful sound of Taps, as we said goodbye to a Hero. She was always my Hero. rice fields to find their parents. and say. Then they eat dinner. to walk so far on Sundays. 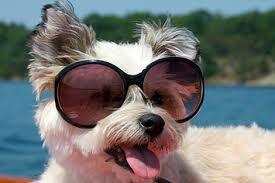 A few days later, the gaudy glasses disappeared, and a deep funk supplanted Dr. Advice’s usually cheery attitude. The search was on, and we circulated throughout the house each looking in likely spots without success. Discouraged, my dear one went to take the garden bins to the curb for garbage collection. As he checked the contents of the bin, he spied a glimmer of light flickering from between the leaves of grass and weeds. Deciding that it could be emanating from something of possible importance, he tossed the leaves aside and there to his surprise lay his sunglasses. Happiness reigned supreme once more. Today he sat on them and broke the frame, so I went to the hardware store and paid $7.99 for glue to mend them. A grand bargain. I woke up a month or so ago and took a good look at my thinning hair and its effect on the wrinkles on my face. It was clearly a cry for help; namely another wig/hairpiece/style. There seems to be some sort of stigma attached to the wearing of a wig, so we will refer to it as a “style”. I have no idea why this disturbs some people. Celebrities obviously would never be caught dead in their own scraggly locks. Watching an old Lucille Ball show, Dr. Advice chirped “There! You can see she isn’t wearing a wig!” Really?! I don’t think his poor old eyes were twirling in the right direction. Not only is she wearing a wig, it isn’t even the right shade of red. Anyway, I ordered one from a reputable place in whom I placed great trust that they would choose a complimentary shade of grey from their 50 choices. Wen it came, I thought it must be wrong, because my hair is blonde-ish, not silver. Well, Dr. A. liked it anyway, so I wore it to Seattle, and first cracker out of the barrel—my daughter did not. I hung it over a door knob during my visit and vowed to try again. This time I bought from a catalogue with a picture of my hair color. The trick to ordering from the catalogue is to cover up the faces because they use adorable young women as models, who probably don’t need a wig anyway. 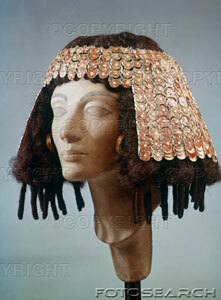 You have to imagine yourself wearing it and flipping it about as you would something actually attached to your head. You don’t want it to scream “WIG” do you? I loved it immediately and plopped it on my head to show Dr. A. I got a thumbs up, so I wore it to Southern California to visit my other daughter. She loved it too, so we went out to lunch at a favorite Mexican place in Camarillo, which is conveniently next door to a wig shoppe. ( I spell it that old fashioned way because it is just on the verge of being posh.) We had with us that day our eight year old great granddaughter Savanna, who flipped out when she saw all the plastic heads staring at us from the window dressed in varying lengths and shades of blonde, brown, black and even one with purple strands throughout, (it was Halloween). Naturally we went in, and since I was wearing the new style, I asked the lady behind the desk if she thought it could use some touches. She played around with it, gave it a spritz of hair spray and off I went, pleased as a puppy with a new bone. That evening my friend Greg said he wouldn’t have known it was a ‘you-know-what’ and I choose to believe him. Now it sits alongside all my other hair styles, some of which really are not my color anymore; there may even be a strawberry blonde one because I always wanted to be a redhead. They probably have more fun than blondes. Vanity, thy name is woman. (I read that somewhere years ago when I was first married. It obviously made no impression.) This will now give Savanna something more to dwell on along with what she calls my fake teeth and fake shoulder. The rest of her family is perking along on all fours. Forgive the idiocy, I simply had to tell you. Author kaytisweetlandrasmussen83Posted on November 9, 2014 November 9, 2014 Categories Aging, Clothing, Family, NonsenseTags Camarillo, daughter, Dr. Advice, great-granddaughter, hair catalogues, hair color, hair styles, hairpieces, Halloween, Lucille Ball, Mexicajn restaurant, red hair, Savanna, Seattle, thinning hair, vanity, wigs, wrinkles22 Comments on WOULDN’T YOU KNOW IT? The job of a translator is to interpret, explain or even to change into another language, and taken in that context, we are all translators. Every day we are trying to reach common ground with someone, to convey something that we know, but which they do not. 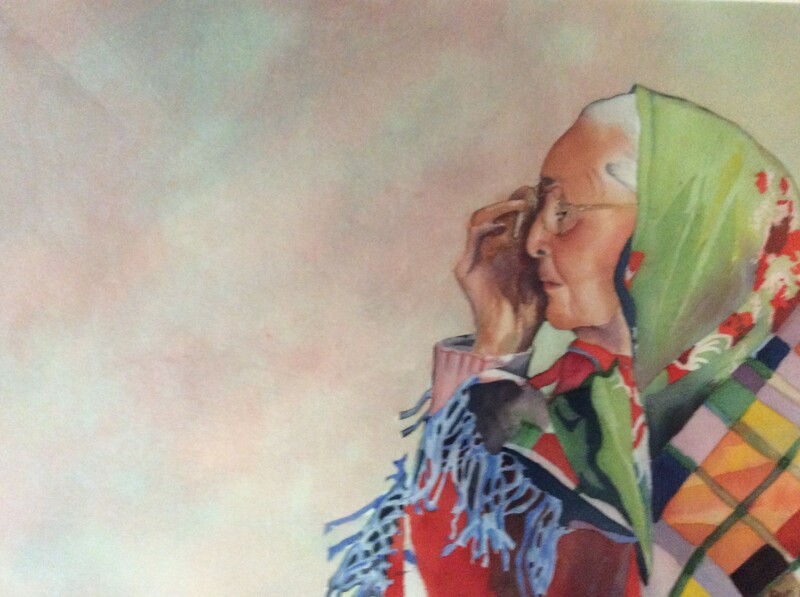 Many years ago, my Native American friend Georgia Oliver, teacher of my children, invited me to spend the summer with her as she visited her family in New Mexico. I jumped at the chance, looking forward to learning more about the Pueblo people and thus about Georgia herself. We traveled across the country, with Georgia driving and me navigating, passing Navajo hogans in Arizona, and visiting Indian traders along the way which Dr.Advice and I were to visit often for the next forty years. So much of what we passed on our way to Laguna where we would be staying briefly, was nostalgic to Georgia. When we arrived at the village of Laguna, New Mexico, we stayed with Georgia’s two elderly aunts and an uncle, who lived in an old building which was once an old mission. Georgia’s grandfather, George Platt, a white engineer came to survey the land with two other white engineers, all of whom married Indian girls and settled in this same mission building! They each raised families of ten or twelve children. Surrounded by a stone fence, the home overlooks the dry bed of the San Jose River and the mesas beyond. There are ancient pueblos dotting the hillsides around. The village consists of mud houses some of which are at least 300 years old. A path meanders over the pitted rock which forms the entire hill behind the house. It is worn in places a foot deep from the footsteps of hundreds of years. Gives one the chilling feeling of connecting with thousands of people who made this their home. You have the sensation that ancient faces are watching and hoping you will not destroy their legacy. The old church founded by Franciscan fathers, has been in continuous use since 1699. We continued on to Isleta, the home of Georgia’s father, where Georgia Oliver became Georgia Abeita, the name of her father, who had been chief of the village. We spent much time in Isleta, using it as our base from which we traveled to places where my Indian American education continued to give rich rewards. We stayed with Georgia’s cousin, Diego and his wife where I was asked if I liked chili. Being a Californian, I expected chili beans, but got chili stew, hot and spicy, along with cantaloup and Kool-Aid. We were rewarded with stories of their past experience at the San Francisco World’s Fair, as well as a period in Hollywood where they were in a couple of movies. We tramped around Chaco Canyon, and visited many Anasazi ruins throughout the area including this one of Mesa Verde in Colorado, which is one of the most famous ruins. To stand and paint this place of the past, is an awe inspiring feeling, and one which places the artist in each of the dwellings, along with the ancient ghosts. You begin to wonder if they really want you to intrude upon their privacy, and it makes your brush travel a little faster. We spent some time at the village of San Ildefonso, where Georgia’s mother had taught school. It is the home of Maria Martinez, who was one of the most famous of Pueblo potters. She and her husband Julian, were also part of the San Francisco World’s Fair, which introduced the black on black Indian pottery to many people. I am fortunate to have several of the black pots, including one of Maria’s. We spent a lovely day with their family, and Maria and I “talked” pots! 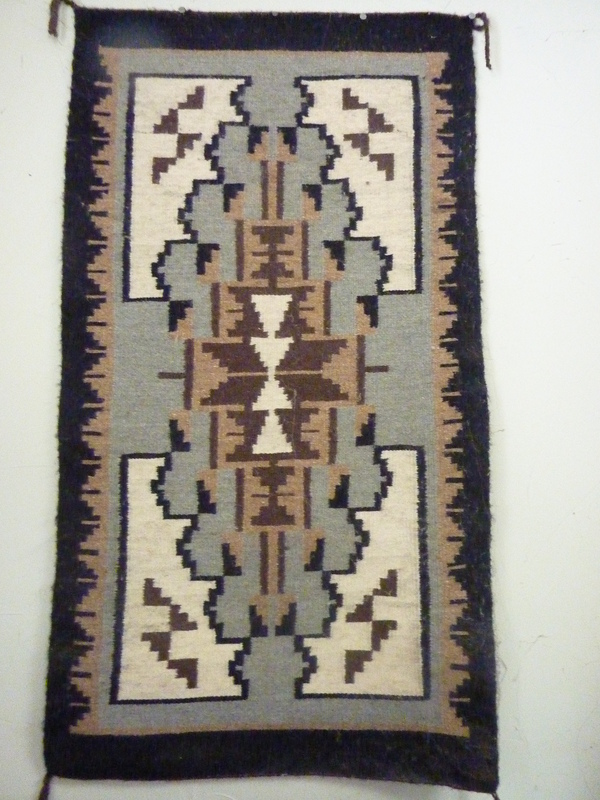 Driving through Navajo country, I was thrilled with the wonderful rugs, and was fortunate to find a lovely Two Grey Hills rug which I have hanging over my computer. 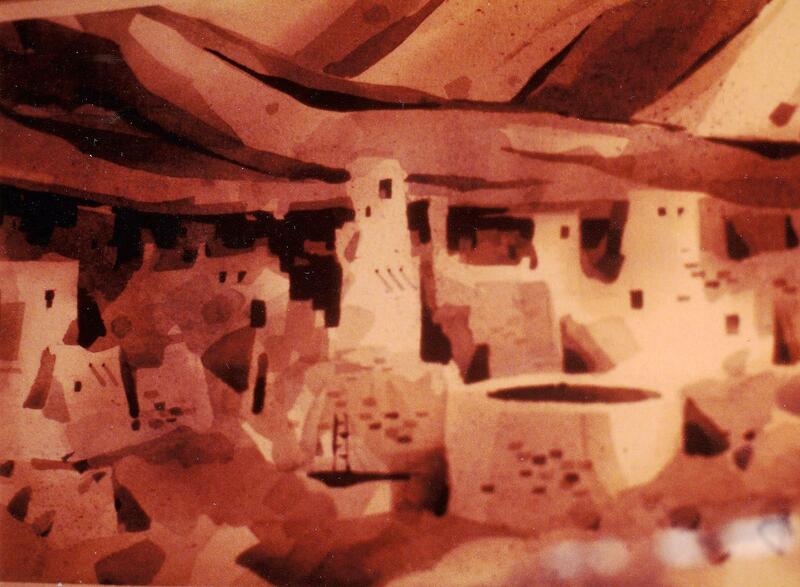 A much larger version hanging in the La Fonda Hotel in Albuquerque, caught the eye of a tourist who wished to buy it. When told it would cost him $25,000 he asked to meet the “Two Grey Hills” assuming that it referred to two old women, and not a place! The summer passed too quickly, and I felt I had made many new friends, along with a number of paintings of these very kind people, who on another visit would honor me with a naming ceremony, teach me to make bread, and give me a greater appreciation of a people who were “different” from me. Translation: We are all alike in many ways.